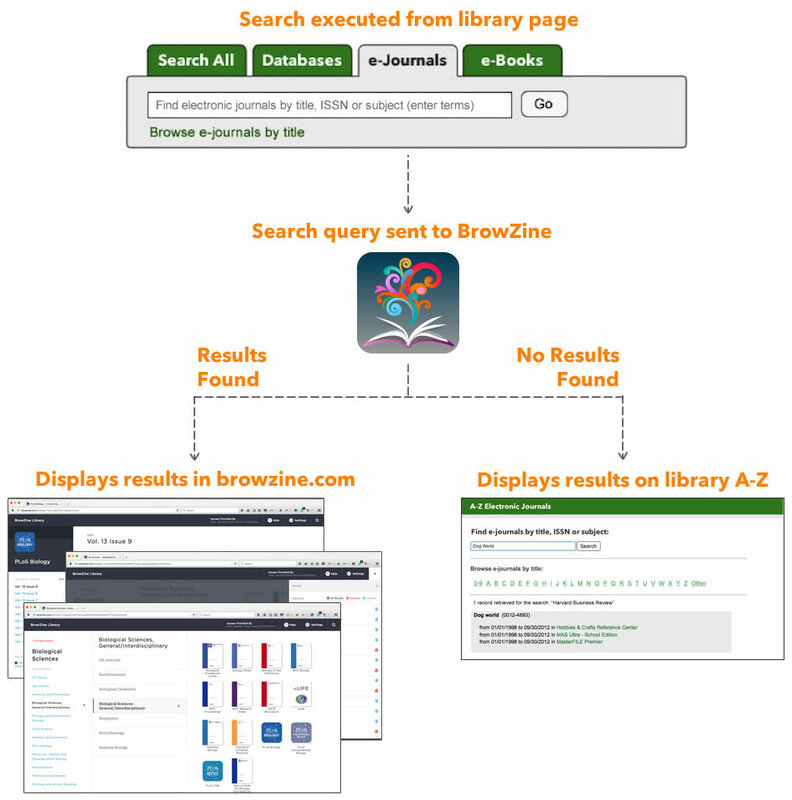 BrowZine now supports external journal lookups directly from your library website! Configure any library web page with a simple A-Z lookup box that connects to browzine.com. This simple box matches against journal title, ISSN or subject without having to resort to a complicated "advanced search" type interface with multiple fields by automatically interpreting what a user is looking for. Users will see their results conveniently appear in browzine.com. Why make BrowZine the first-stop for journal lookup on your website? 1) Minimize user confusion - Most A-Z systems are built for librarians who understand what a myriad of database names next to each title mean. For many typical end users this provides a point of confusion and frustration. What source should they choose when there are overlapping dates? Since all titles are presented in a uniform manner, the interface makes it easy for users to bounce from title to title without having to retrain their mind on how to interpret multiple interfaces, or choose from a number of sources for the same material. 3) Rich browsing experience - BrowZine returns subject results in addition to journal results if a user uses a broad term like "surgery." This allows a user to easily see a host of journals, similar to the ones they are familiar with, presented in a easy-to-grasp graphical format, and scoped to your library's holdings. If a user looks up a specific journal title instead, each journal lists the subject areas under which it is classified, allowing the user to continue browsing for similar titles. 4) High Performance - The BrowZine title lookup typically executes in a fraction of the amount of time of most A-Z systems. When used within BrowZine, it provides predictive capabilities for real-time feedback on your query! 5) Integration into A-Z Systems - As seen below in the Sample Lookup, if a user is looking for something not currently supported by BrowZine, we intelligently route the query to your A-Z system, just like your external lookup tool does today! But if they are looking for one of the tens of thousands of supported BrowZine journals from the world's top publishers then they will IMMEDIATELY get to the tables of contents of that title, or see multiple matches within BrowZine. 1) If the result is an exactly ONE match for a title BrowZine will launch and go directly to that table's current issue! 2) If the result is an exactly ONE match for a subject in BrowZine, it will launch and show that subject area. 3) If the result is multiple matches found in BrowZine, it will launch and show the results set so that the user can choose from the results. 4) If there are ZERO matching results, BrowZine will NOT launch but instead the query will automatically be redirected to your current A-Z system. Thus, for the majority of user searches they will get to content faster and be immersed in the easy to use BrowZine interface. However, if someone is looking for a non-BrowZine enabled title, the experience will be exactly what it is today - that they will go on to your existing A-Z system which will route them appropriately to where that content is available. Visit http://thirdiron.com/search-demo/ to see BrowZine External Search in action via our live demo. An identical form to what you see in the demo can be placed on any page on your library’s website (including A-Z system sites, LibGuides or any other platform that supports adding your own HTML). You will need your numerical BrowZine library ID. You can find your BrowZine library ID by going to browzine.com, logging in to your library (if you are not done so automatically by your IP address) and looking at the browser address bar after logging into your library. Your library URL will contain your numerical library ID. If you need further assistance in locating your BrowZine library ID, please email support@thirdiron.com. To customize the form HTML for your library, simply replace the red <library_id> values in the code below with your numerical library ID. If you do not have an existing e-journal lookup form, you may copy and paste the below code onto your web page. This code contains the basic HTML required for the search to function (meets WCAG 2.0 guidelines).